Back in college, I remember stumbling upon a list of the “best movies of all time” in one of my media intro courses. I was surprised to discover that I hadn’t watched very many of them at all (I fell asleep watching Gone with the Wind as a child). I was temporarily ashamed at my apparent lack of culture, but the discovery sparked a film rampage that lasted until I graduated. Remembering the profound impact some of those films had on me, I decided to put together a list of must-see movies for college students containing some of these, interspersed with a few rite-of-passage flicks, college cult classics and movies to make you think. 1.) The Godfather. As a woman, I thought this was merely a dude movie, and I admit the only reason I watched it was to finally understand the references to it in one of my favorite romantic comedies, You’ve Got Mail. But when watching this Academy Award-winning film, I got wrapped up in the complex plot, the family dynamics, the considerations on good and evil, and the inevitability of Michael’s rise to power in the mob world. In this vein, I also recommend cult classic Boondock Saints, another supposedly stereotypical dude movie that actually transcends gender. I remember posters for both of these movies plastered all over dorm room walls. 2.) A Beautiful Mind. Wow. What a movie. This one got me thinking about the different forms mental illness takes, and how even the brilliant are not immune. Russell Crowe plays the role of a gifted mathematician who discovers a groundbreaking mathematical principle as a graduate student at Princeton, and later becomes a professor at MIT, where his mental illness shapes a bizarre reality from his viewpoint. Another movie in this vein that explores a dangerous world created through mental illness is Shutter Island. 3.) Good Will Hunting. Like A Beautiful Mind, this film also involves a college setting and a gifted mathematician. Matt Damon’s character Will Hunting is a janitor who solves a particularly difficult math problem left on a chalkboard in a college classroom. This brings him to the attention of a professor who believes Hunting has potential. Hunting confronts the abuse of his childhood with the help of a therapist and is able to finally move forward with his life. Any college student who isn’t deeply moved by the “It’s not your fault” scene with Robin Williams has a heart of stone! 4.) Animal House. You can blame this movie for helping propagate all the stereotypes we know and love about college and fraternity life, like toga parties, road trips, pranks and copious amounts of alcohol. It also offers nothing of the value that the previous three films I’ve named have, and critics have called it a brainless disservice to what college life is really like. 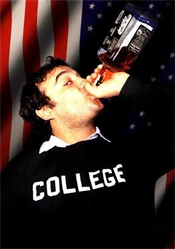 That being said, this movie is hilarious and I seem to recall a lot of the behavior and antics I saw in Animal House happen in real life back when I was in college. But no matter. For more funny crap involving a road trip to take your mind off of finals, watch Dumb & Dumber. 5.) An Inconvenient Truth. Climate change is a huge challenge that must be confronted by this next generation, and many of today’s college students will become key leaders to effect social and political change. This documentary film will get you talking and thinking about the reality of the environmental damage humanity has caused, despite any pre-conceived opinions on Al Gore. Other great documentaries I recommend for college students are Invisible Children and Supersize Me. 6.) Son In Law. Another goofy comedy that exaggerates college life, Son in Law is a ’90s movie featuring Pauly Shore as Crawl, a crazy UCLA college student apparently majoring in college who takes a trip to a female friend’s conservative South Dakota farm, where hilarity ensues. The film does remind you how very much college can change you from your hometown roots. 7.) Garden State. This low-budget, coming-of-age movie featuring actors Zach Braff and Natalie Portman took the college scene by storm and became a cult classic in 2004. The two portray characters that meet and hash out their personal issues in a small town in New Jersey accompanied by a soundtrack filled with awesome songs from The Shins, Coldplay, Colin Hay, Remy Zero and Iron and Wine. Guest Bio: This guest post is contributed by Kate Willson, who writes on the topics of best online colleges. She welcomes your comments via email at katewillson2@gmail.com.